The Posey Bed 8060 is an A-Frame canopy system. When attached to a compatible hospital bed (not included), the 8060 is designed to help provide a safe, controlled environment for patients at extreme risk of injury from a fall or unassisted bed exit. 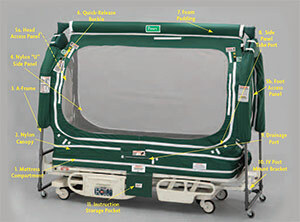 Depending on the features of the bed, operational limits must also be observed when a Posey Bed canopy is in use as described in the User Manual. RECOMMENDED USE: Patients at extreme risk of a serious injury from a fall, or unassisted bed exit. Includes Fully Automatic Hospital Bed. Enclosed Patented Mattress Compartment helps reduce the risk of patient entrapment. Water-repellent, skin friendly, and durable nylon canopy. Four access panels for patient care from all four sides. Quick-Release Buckles lock the zipper pull-tabs for added patient security. Perimeter Guards for temporary use during patient care. Foam Canopy Pads around the metal canopy frame. Four Tube Ports: One on each side of the head and foot of the canopy. Locking Casters to secure bed during patient transfers and when patient is unattended. Enclosed EXPANDA BLE Mattress Compartment. Designed to fit a 6 inch (15 cm) mattress or a ten inch (25 cm) air mattress. Nylon Canopy. The nylon material is water-repellent. A-Frame. A sturdy “A” shaped metal frame supports the Nylon Canopy. Two “U” Side Panels. One (1) panel on each side with a single zipper on each panel for easy patient access. Head (5a) and Foot (5b) Access Panels. 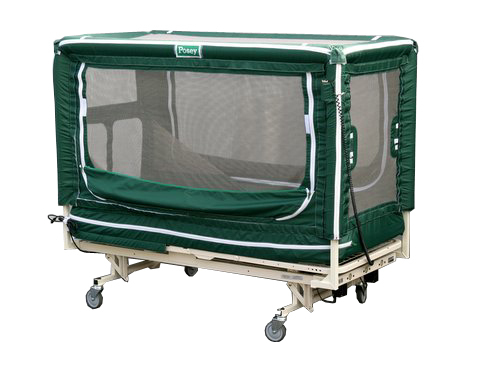 Helps provide easy access to the head and foot of the bed with a single zipper on each panel. Quick-Release Buckles. Clipped to zipper pull-tabs for added patient security. Foam Canopy Pads. Six (6) pads fit around the canopy frame to help reduce the risk of injury from contact with the frame. Tube ports. Eight (8) ports, two on each of the four sides of the canopy to run tubes into the patient compartment. Drainage Ports. Two (2) ports, one on each side of the “U” Side Panels. IV Post Mount Brackets. Four (4) brackets, two on each side of the “A–Frame”, to firmly attach the frame to the IV socket on the hospital bed. Posey Bed Instruction Storage Pocket. Stores all product Manuals and the “Quick-Check 10” for easy reference. An inflatable air-type mattress that is ten inches high, thirty-five inches wide and eighty inches long (10” x 35” x 80”) (25 cm x 89 cm x 203 cm). Any other size mattress may result in damage to the bed, patient injury or death. Completely unzip the mattress compartment. Completely zip the mattress compartment closed. Find the expansion zipper under the instruction storage pocket on the side panel. Fully expand the mattress compartment by unzipping the zipper around the entire length of the mattress compartment. Follow instructions above on how to install a mattress. Always use the proper size mattress(see “Choosing the right mattress” above). Using a smaller mattress will result in gaps between the canopy and mattress. Using a larger mattress will stress the fabric and may damage the zipper. Never open or close the mattress compartment while the head or knee of the bed is in the UP position, as this may damage the fabric and/or the zipper. Never use a mattress less than six inches(15 cm) high. Always make sure the expansion zipper is fully closed when using this size mattress. Never use a mattress smaller than ten inches(25 cm) high when the compartment is expanded. Make sure the expansion zipper is closed when using a six inch (15 cm) mattress. Never put a mattress inside the patient area of the bed. A failure to follow these warnings may result in excess material in the patient area and increase the risk of serious injury or death from entrapment or suffocation.